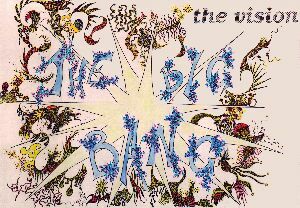 The Vision is the big-bang, the starting point of everything. The Vision is an awareness of today's reality and a projection onto tomorrow's potential reality. The Vision is not a "dream" nor "wishful thinking". The Vision is always pragmatic and specific, a clear representation of what the future will be. The Vision creates a "tension", a spring that can release pure energy toward a target situation. Through the Vision, objectives become clear, achievements and results get closer and closer. Enterprises, top management of enterprises and people in enterprises need a Vision. The Vision defines targets and strategies to get to the targets. In a "top-down" style, a Vision filters down and gets to all corners of an enterprise. A Vision needs to be "shared". A Vision considers and focuses on objectives to be converted into results. A Vision considers and focuses as well on values and cultural principles associated with those objectives and to be used as guidelines when transforming the objectives into achievements. In a rapidly changing world, certain aspects of a Vision may dynamically adapt and change. 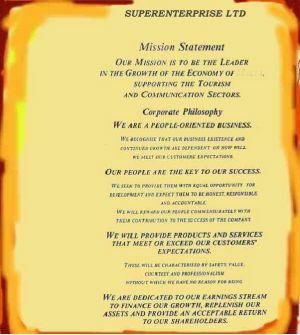 The main parameters of the Vision may conveniently (but not necessarily) be documented in a Mission Statement. The Enterprise's Mission is, primarily, in people's mind. A documented Mission Statement, converting the main parameters of the Vision into well-spoken sentences, may represent another valid starting point for the enterprise aiming at world-class status. As such, it may be printed and posted up in the enterprise's reception area and other significant places, sculptured in solid marble stone, or cast in bronze or gold. However, to be effective, it must become facts (and not remain words only....). This means it must be "shared" and "lived" by everybody. If the Vision is missing or blurred and the Mission is not defined people can only work for survival. When the Vision is clear and the Mission is well defined people can work for achievement. Internal/external communication channels and parameters may be identified and set. The enterprise's mission may conveniently be sub-divided into Unit Missions, defining what each Enterprise's Unit has to generate as output. Unit Outputs converge into the common goal of transforming enterprise's Objectives into Results, in the respect of enterprise's Cultural Principles and Values. "Channelled" action may now take place. Pointless to say, in this new millennium Vision and Mission must be structured in line with healthy principles of Lean Thinking (more »).